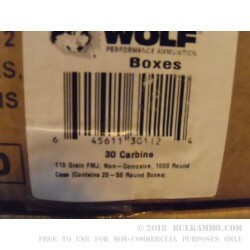 Feed that M1 Carbine without breaking the bank with Wolf’s 110 grain, 30 carbine ammo. The M1 Carbine is a pure joy to shoot, and with Wolf’s steel cased round the shooting lasts even longer. 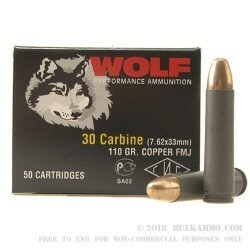 This 110 grain full metal jacket bullet uses a traditional lead core, covered by a copper jacket with an exposed base. This enhances accuracy over a fully enclosed bullet while producing less fouling than an all lead bullet. After all, it’s important to keep that carbine clean. The steel cases make this an affordable option, and because they use a soft steel will be just as easy on the gun as a brass cased round. 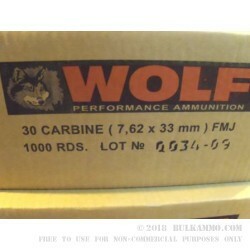 A surprising powerhouse in a compact package, the .30 Carbine round from Wolf delivers the same terminal performance as a .357 Magnum FMJ, making this round suitable for small and medium game. 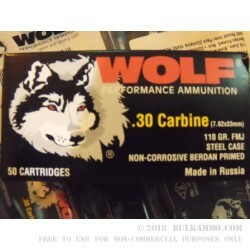 Wolf packages their ammo in boxes of 50, so you can shoot more for less.